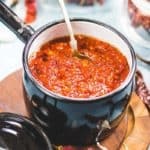 This Homemade Schezwan Sauce or Szechuan Sauce is an interesting recipe to make at home. It is one of the most popularly used ingredients in Indo-Chinese cuisine. 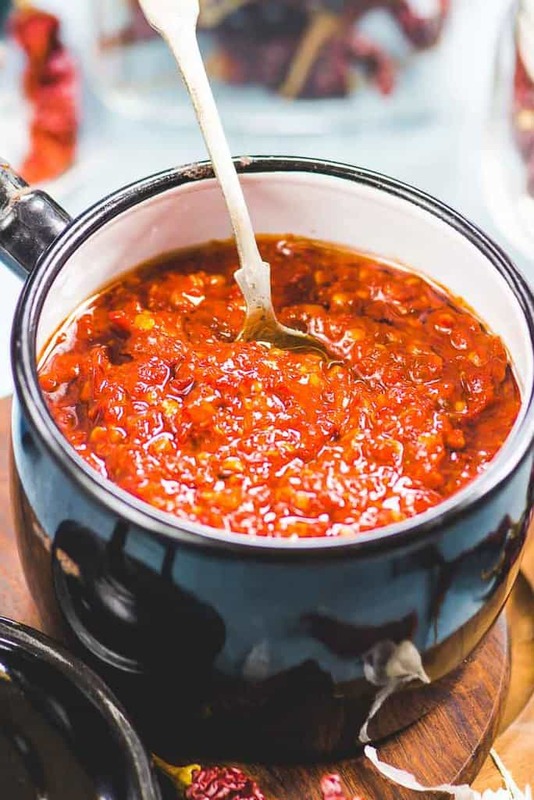 Instead of settling for store bought sauce, why not make your own homemade version of this flavourful Chinese Hot Sauce? Here is a simple video recipe to make authentic Chinese Schezwan Sauce. 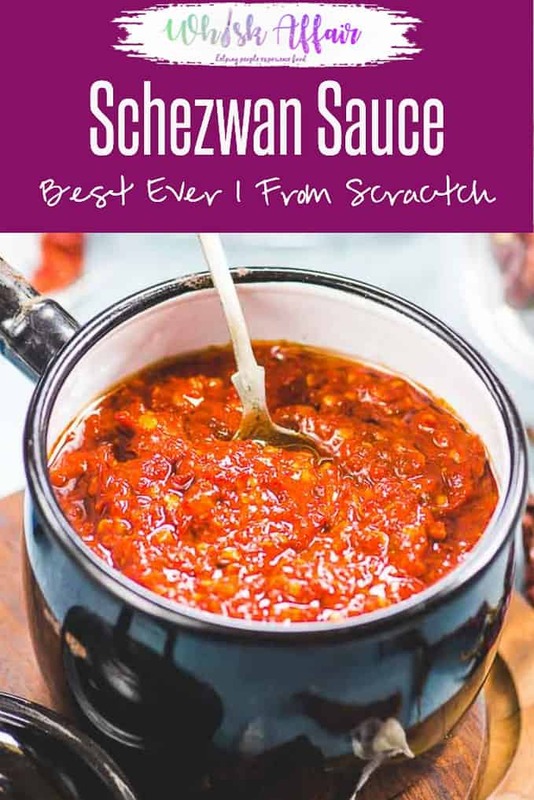 Schezwan Sauce can be used to make Indo Chinese dishes like Schezwan Dosa, Schezwan Egg Fried Rice, Veg Schezwan Noodles and Schezwan Fried Rice, but that’s not all, you can use this Szechuan Sauce as an accompaniment or dipping sauce for a variety of different dishes, from dumplings to potato wedges. This sauce has recently gained popularity after Rick and Morty fans flocked to the nearest McDonalds’ stores to get some of this sauce along with their burgers. You can read more about it here. Stir fry your vegetables like beans, eggplant, peppers etc and add a tsp of this Szechuan sauce for some added flavour. Stir fry rice and noodles using this sauce. Use it as a dipping sauce for momos, fries and chicken lollipops. Coat manchurian balls in this fiery sauce. Add some in yogurt and make a healthy salad dressing. Add szechuan sauce in soups or stews. To make Szechuan sauce, you will two variety of Chillies. One which gives a nice red color to the sauce and is less spicy and other which gives the heat. I have used dry Kashmiri Red Chilli for Color and dry Bedgi Chilli for heat. You can choose any variety which is easily available to you. If you live in the US, you can order Chinese Szechuan Chillies from Amazon to make this recipe. These will give a very authentic taste to the homemade Szechuan sauce. You can also check your local Asian store to source the Szechuan Chillies. You will need Sichuan peppercorns for the traditional flavour but if it’s not available, feel free to skip it or use black peppercorns instead. Order it from here if you live in the US or get from an Asian store. Other than these, you will need minced ginger and garlic, soy sauce, vinegar and tomato ketchup. Some people also add sesame seed powder to their sauce. You can try adding 1 tsp of it too. A splash of Sake will also enhance the taste of this Szechuan Sauce a lot. How long can we store Szechuan Sauce? This sauce lasts for atleast one month in refrigerator and if you want to store it even longer, you can freeze it for upto 9 months. How to make Schezwan Sauce? 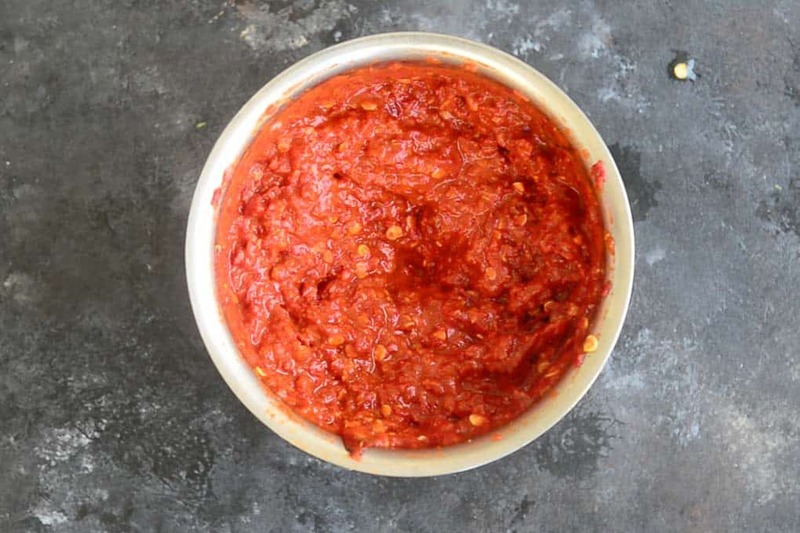 You won’t believe how simple this sauce is to make. To make this Homemade Schezwan Sauce recipe, we are making use of two different types of chilli. One that gives a nice color to the sauce but is less hot. 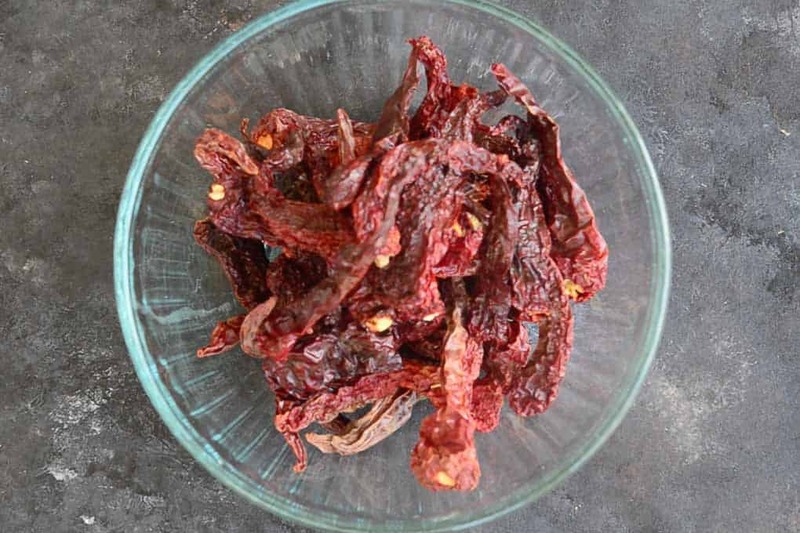 I have used Kashmiri Red Chilli but you can use any chilli which gives a nice color and less heat. The other chilli is the one which is slightly hot and gives the heat to the sauce. 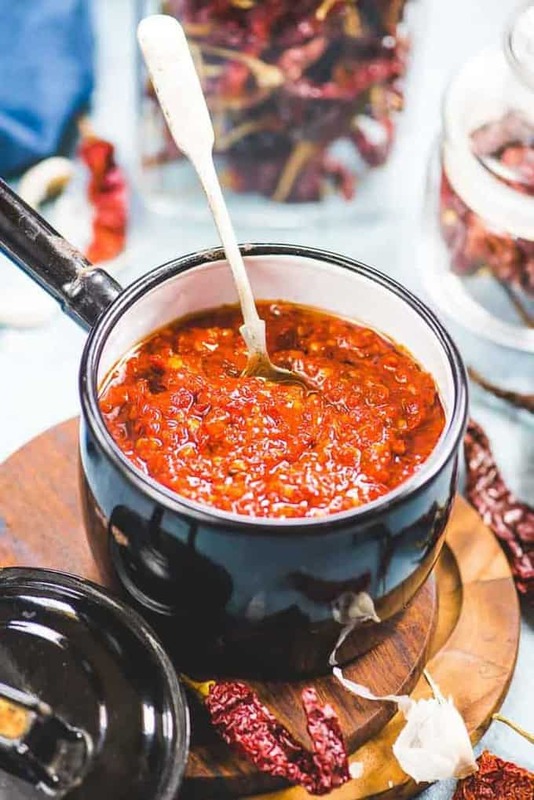 This Chilli is used in order to increase the spice quotient and give this Schezwan sauce a slightly hot after taste.I have used Bedgi Chilli but you can use any chilli which has good heat. 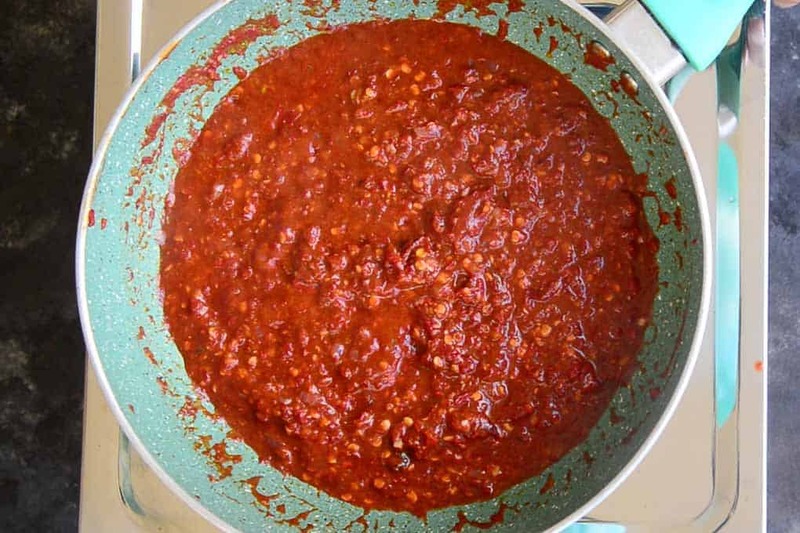 If you get hold of Chinese Szechaun Chillies, they are the best to make this sauce. I have not removed the seeds of the chillies but if you want a more smooth sauce, you can remove the seeds of the chillies before soaking them in water. To start making this homemade Szechuan Sauce recipe, the chillies are to be soaked in water for about half an hour. 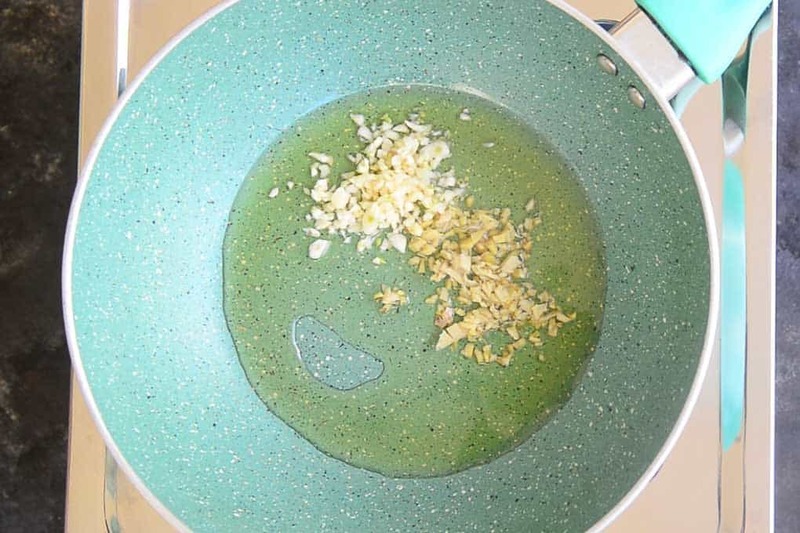 Once soaked, the chillies are mixed in a grinder to form a coarse paste. Then oil is heated in a pan and to this we add in the finely chopped ginger and garlic and fry for a few seconds. Once fried, we add in the onions and cook it for a few more minutes. To this mix, crushed Sichuan peppers are added in with chilli paste and water. If Sichuan peppers are not available, you can totally skip them or replace with some black peppercorns. 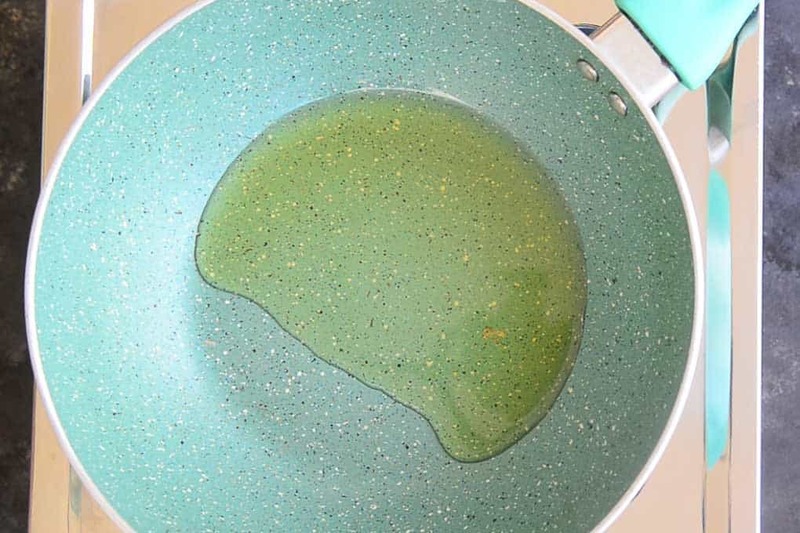 Once the mixture cooks for a few minutes, soy sauce, vinegar, tomato sauce or ketchup, brown sugar and salt are added and cooked till the oil starts floating on top. The pan is then removed from the heat and allowed to cool. The sauce is to be stored in a glass jar and it can be stored for up to one month in the refrigerator, but it’s usually over before you know it. It can be used as an alternative to ketchup and it’s great to add a touch of warmth to any dish. Full of the pungent flavours of spice and a touch of sweetness, it makes any dish simply irresistible. Do try out this recipe and you can also make custom made bottles of this sauce and share it with friends, they are going to love this delicious gift that they can use for a host of different dishes to give it a whole new flavour. In the coming winter months, we are all looking to spice things up; this would be the perfect addition to your winter recipe list. Here is how to make Homemade Schezwan Sauce Recipe. Does Schezwan Sauce contain Ajinomoto? The store bought version of this sauce might contain ajinomoto or MSG as it increase the umami flavour but when made at home, you can control not adding it. That is the reason I highly recommend making this sauce at home and be sure of what goes it it. How to make Gluten Free Szechuan Sauce? All the ingredients in this recipe except soy sauce and tomato ketchup have gluten. To make a gluten free version, replace soy sauce with Tamari and tomato ketchup with gluten free tomato paste and you will have a gluten free version of this sauce. How to make Keto Szechuan Sauce? 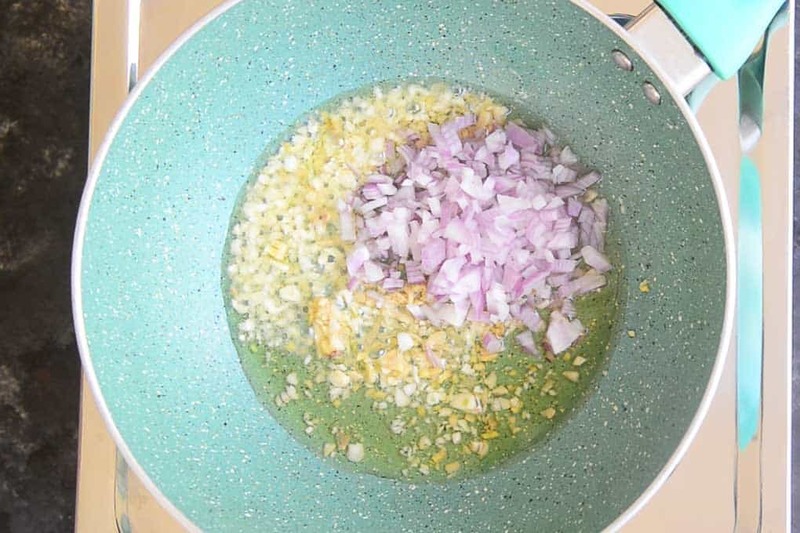 The store bought version of this sauce might have some carbs added to it but the one we make at home in a traditional way has no carbs and so is totally Keto friendly. Soak the chillies in hot water for 30 minutes. 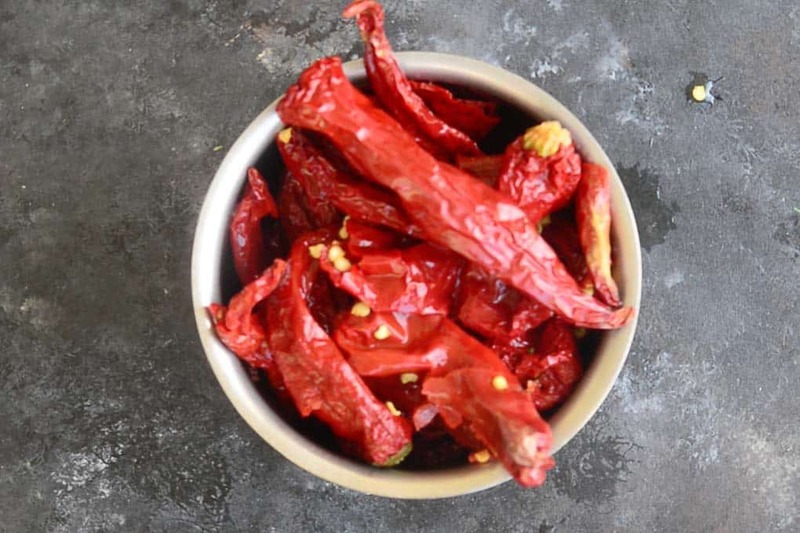 Drain the water and add the chillies in a grinder along with 1/4 cup of water and grind to make a smooth paste. Once the oil is hot, add ginger and garlic and fry for a few seconds. Add Sichuan peppers and chilli paste along with 1/2 cup of water and cook for 2-3 minutes. Now add soy sauce, vinegar, tomato ketchup, brown sugar and salt and cook for 5-6 minutes. Remove the pan from heat and let the sauce cool. Store in a clean glass jar for upto 1 month in refrigerator. 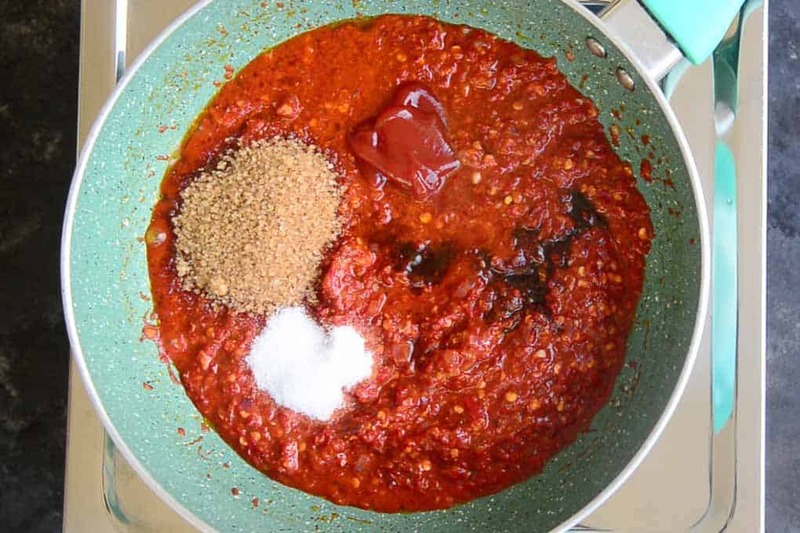 Schezwan Sauce Recipe is one of the most popularly used ingredients in Indo-Chinese cuisine. Instead of settling for store bought sauce, why not make your own version of this flavourful sauce? Remove the pan from heat and let the sauce cool. Store in a clean glass jar for upto 1 month in refrigerator. 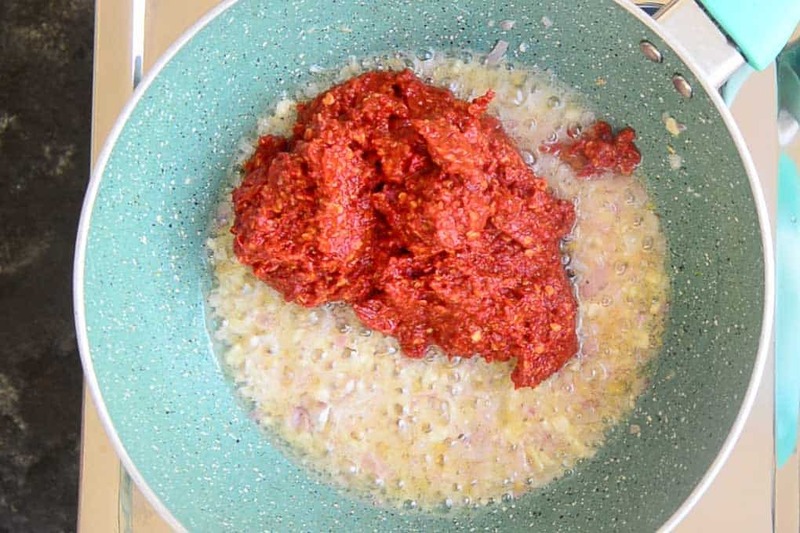 To make this Schezwan sauce, we are making use of two different types of chilli. One is the Kashmiri Red Chilli, that’s not very spicy, but it adds that much needed bright red colour. 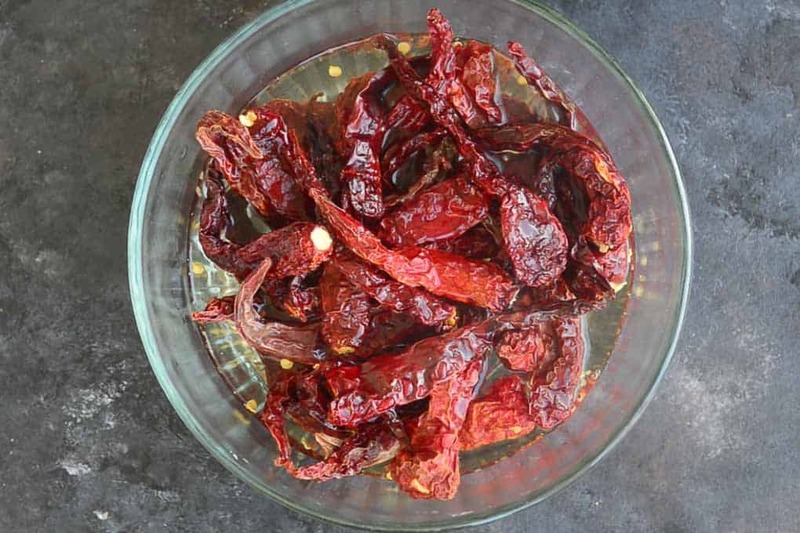 If Kashmiri Red Chilli are not available, you can use any chilli which gives a nice color and less heat. We are also using Bydagi Red Chillies in order to increase the spice quotient a bit and give this Schezwan sauce a nice after taste. This chilli is not very hot and also add good colour to the sauced. If you want your sauce more hot, you can use any chilli which has a good heat. Remove the seeds of the chillies if you want a really smooth sauce. This sauce stays good in refrigerator for up to 15 days. You can divide the sauce in small portions and freeze for later use. Just take out one portion, thaw it and use as required. You can add 2 tbsp chopped celery to the sauce along with onion It will enhance the taste of the sauce even more. VERY NICE RECIPE , I think if we will take jaggary instead of sugar it will give delicious taste. Thnx. Sure you can do that.